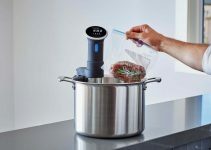 Amateur cooks and five star chefs consider sous vide cooking to be the easiest way to cook just about everything you can think of to perfection. It’s a no fuss way to make all your favorites, and impress all you friends with your newfound culinary expertise. 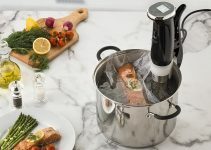 One of the difficulties of sous vide cooking, however, is being able to turn it on and leave your food to cook and having peace of mind that it will cook evenly. 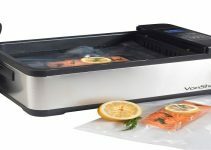 If you leave your food loose in the sous vide bath, often times your food will collect at the bottom, which poses all sorts of problems. Most notably, food all bunched together during the sous vide process is likely not going to cook evenly because water reaching all parts of the ingredients is essential to proper cooking. Luckily, there is a solution to this all too common sous vide struggle. The Perfect-Sousvide 6PL1R Clear 6.5 Gal. Polycarbonate Pan keeps sous vide simple. Take all the guess work out of sous vide cooking, and cook with confidence knowing that your meal will be cooked to perfection each and every time you use the sous vide method. The time and consideration that went into this design really shows in the quality of the final product. First, let’s talk about the actual pan itself. The pan is made out of transparent polycarbonate, and that’s key because it helps you keep an eye on your food as it cooks. Often times food can shift during cooking, and if you can’t see what’s happening it can lead to uneven cooking, or unnecessary fiddling on your part. The fact that the pan is clear can lead some people to the mistaken impression that it is somehow not durable. That could not be further from the truth. If you’re going to using material to cook it better be durable, and that is certainly the case here. The polycarbonate can safely handle even boiling water, so the temperatures used in sous vide cooking is no trouble at all. The rack included in the polycarbonate pan is probably the greatest feature of the overall design. It’s made of stainless steel, so you know it’s going to last. The rack also has a rubber base to hold it in place, and plastic handles that will remain cool all throughout the cooking process. One last not about the rack, and it’s an important one. The rack is adjustable, so any food item that you might want to cook is your sous vide pan is going to fit, and stay secure throughout the cooking process. It’s a final touch that makes sous vide cooking easier than it has ever has been before. The pan comes equipped with a rack that will keep your food secure, and properly spaced while cooking. It’s a great addition that’s made all the better by the fact that rack is also adjustable and will accommodate any and all food items you might want to cook. The pan itself is made out of polycarbonate, and that’s a huge addition to the plus column for a couple different reasons. First, it’s clear so you can manage your food while it cooks without the difficulty presented by other opaque designs. It’s also incredibly durable, suited for sous vide cooking, and dishwasher safe. This might not be considered a “con”, but it’s certainly worth mentioning that this pan does not come with the circulator you will need for sous vide cooking. With that being said, they have gone to great lengths to see that it’s compatible with as many sous vide circulators as possible. Compatible circulators include Anova Precision Cooker, Anova One, Sansaire, and Nomiku Classic. All of these designs will fit and work well with the included lid. If you have a circulator and need a pan, or even if you’re not satisfied with the sous vide bath that you currently have, this is an excellent product that you will be very happy with. It’s perfect for all types of sous vide cooking, durable, and has a well thought out design.